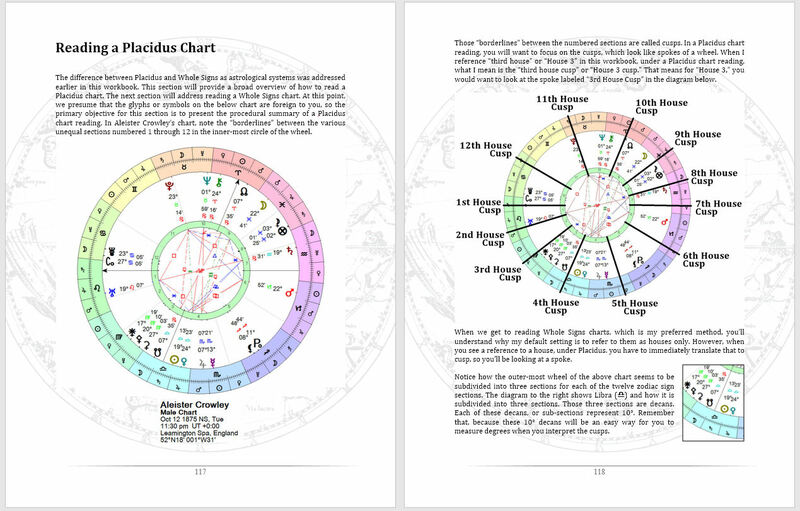 This course does not teach chart construction and will only cover how to read a chart that you already have on hand, Placidus or Whole Signs. 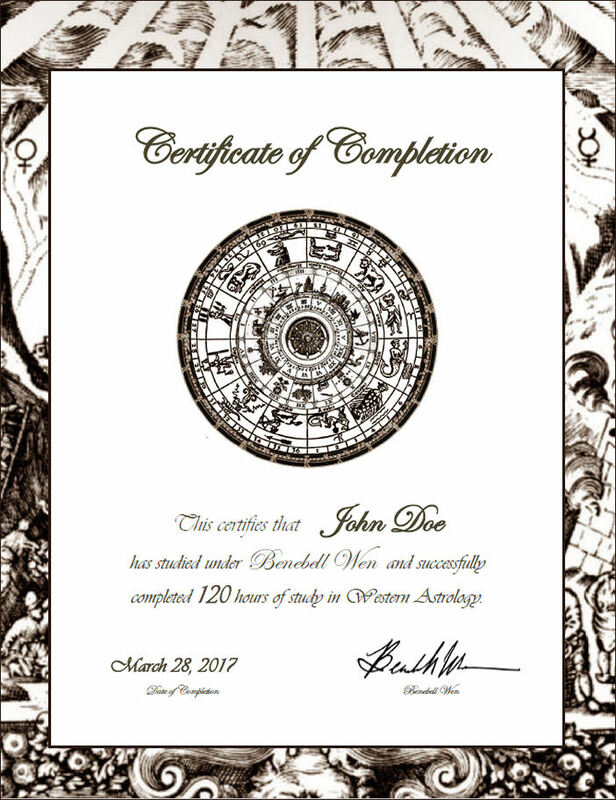 After covering the basics, you will learn how to read a natal chart, perform transits astrology readings, get a sense of both traditional astrology and modern astrology, dwarf planets and asteroids included, and if I’ll be damned, you are going to have one rock solid foundation in Western astrology that won’t be beat. 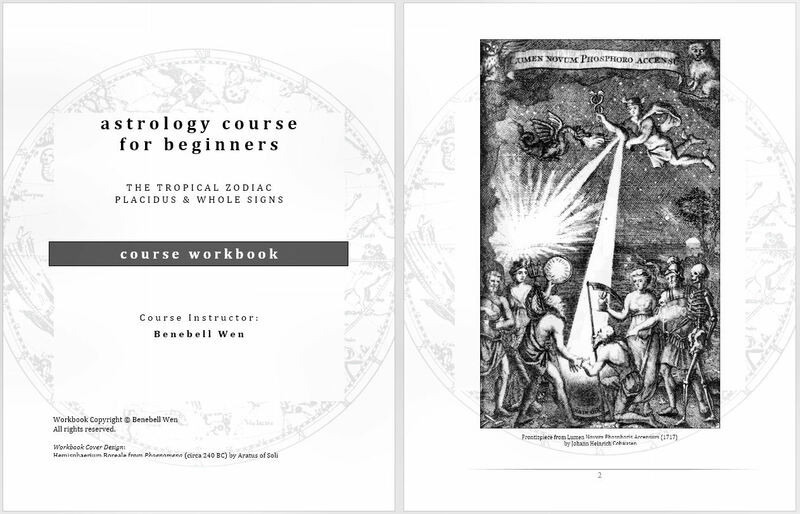 Competitive in content, by scope and depth, to beginner astrology courses that cost in the hundreds, Astrology Course for Beginners is intended to be budget-friendly, so everyone can learn how to simplify the complexities of Western astrology. This is a “quiet” course, taught primarily through your own independent reading and study of a two-volume workbook set, for a total of over 500 pages. 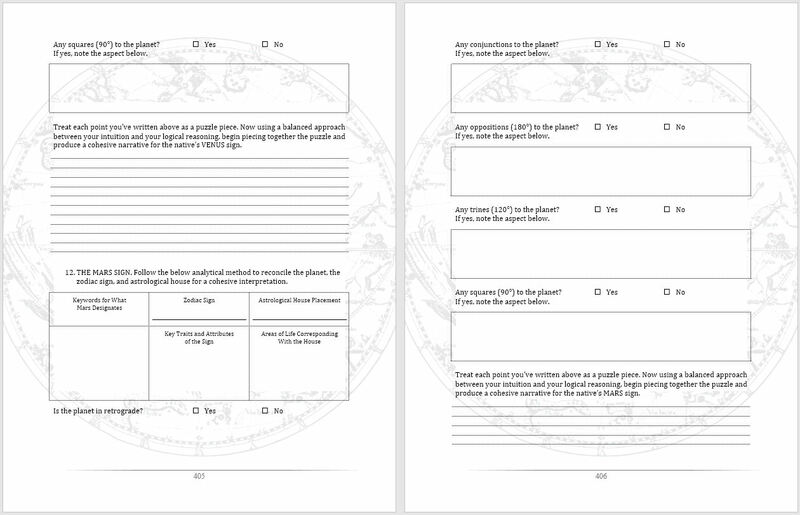 The workbooks are intended to be worn in, meaning these pages consist of exercises and practicum. 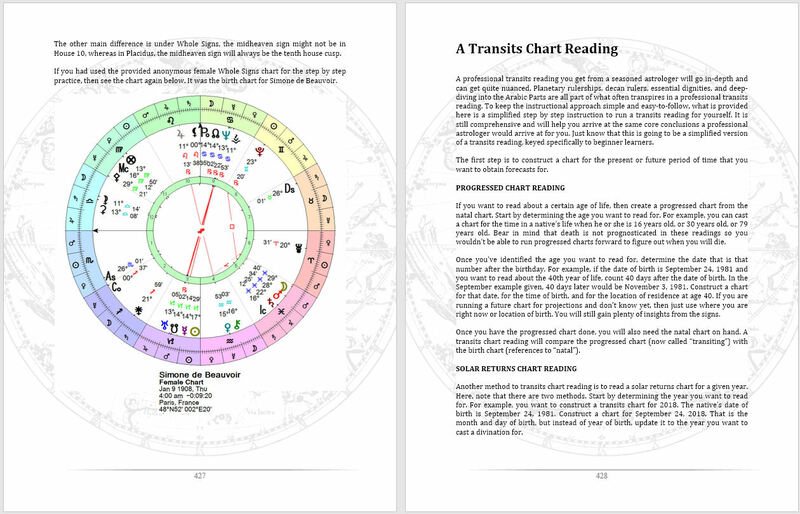 Only by doing the exercises and practicing astrology readings on the charts provided in the workbook can you gain proficiency through this course. The learning process happens as you follow the practice exercises in the workbook. That’s the core mode of learning– practice exercises in the workbook and then checking your answers against model answers. You’ll also be expected to assemble your own astrology study journal (what I like to call your astrology grimoire). 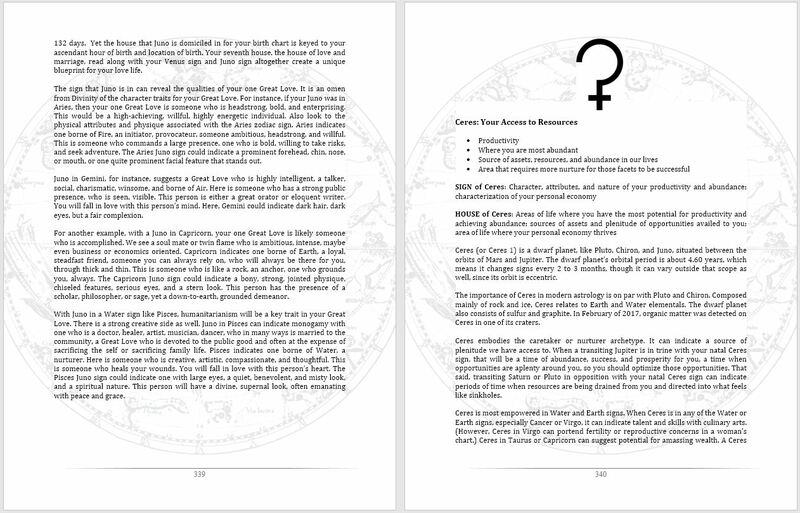 A blank journal template for your first astrology grimoire is provided along with instructions on how to put it together. There will also be an introductory video lecture to commence your studies. 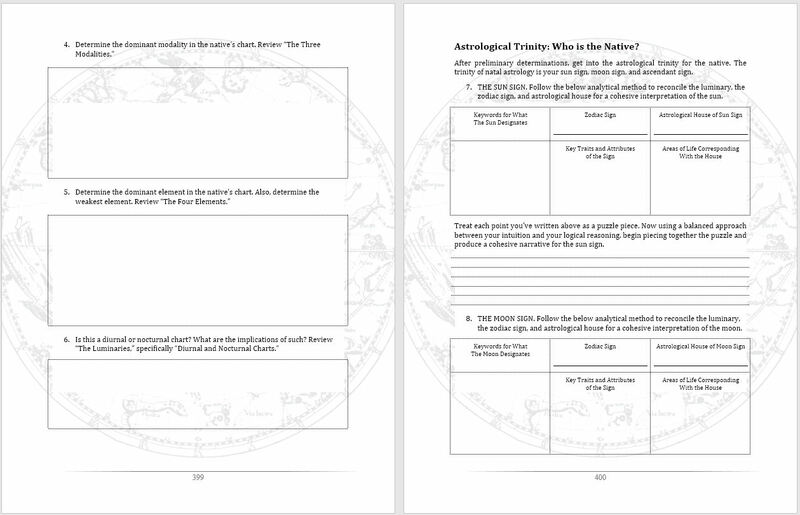 Although the course content itself is beginner level astrology, presuming no prior knowledge on the subject, the pedagogical approach is structured after a graduate level independent study seminar. If you have never taken a college-level independent study course before or don’t think you would be prepared to keep up with the rigor of a college-level course, then my instructional approach is not going to be right for you. 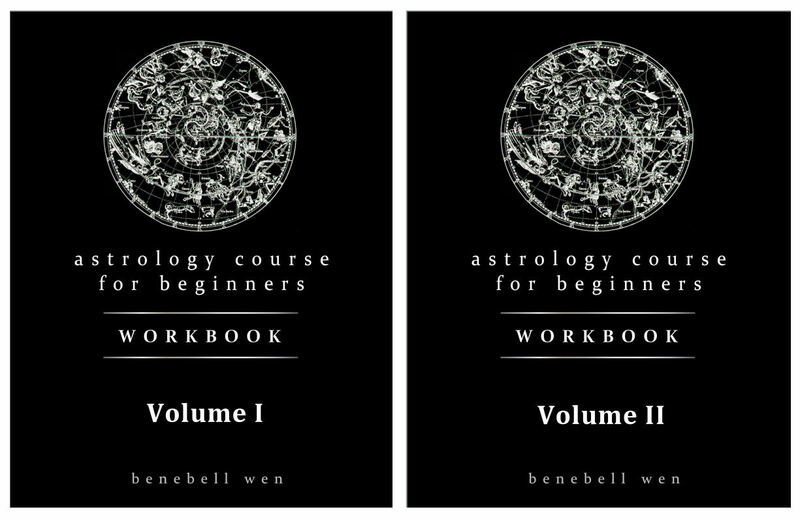 The accompanying videos will only guide your use of the workbook and how to approach astrology. 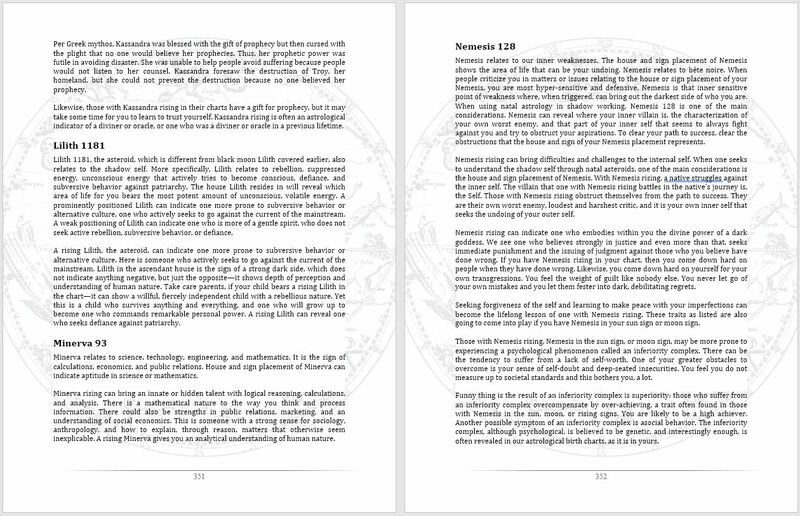 Actual teaching and instruction are done through the workbook. In other words, there is a lot of reading involved. A lot. And lots of exercises. You will be doing a lot of writing or typing. 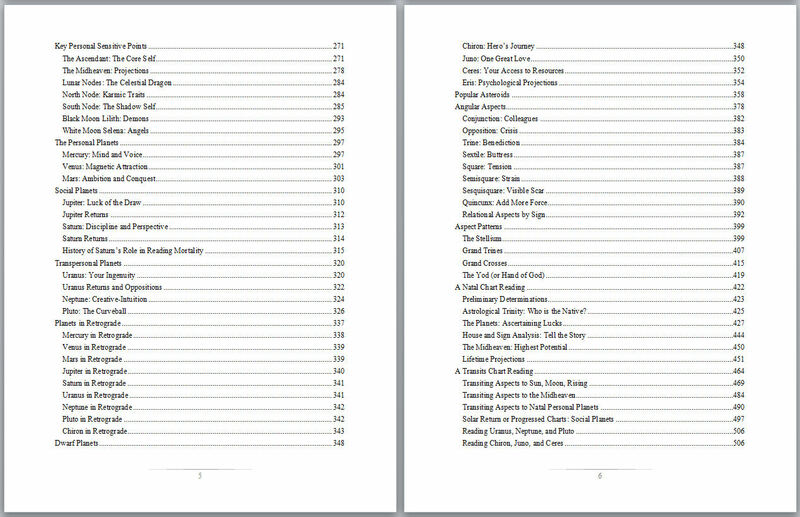 From the table of contents, you’ll see how broad in scope this course will be. Look at the number of pages in the workbook and you’ll see how deep we go. Click on any image below to enlarge viewing. I will be setting up a private Facebook group where anyone who ordered the course can join if they choose to and connect with other astrology enthusiasts. Discussions won’t be limited to astrology! We’ll talk about all the various metaphysical intersections with astrology, including tarot, numerology, craft, and more. Share your astrological interpretations of charts and offer your insights to others. The private Facebook group will be our best attempt at a classroom setting where “after school hours” the participants in the course can chat with each other and interact. Please note that due to my schedule, I won’t be able to stay active within the Facebook group and may not be able to join in on every discussion. I’ll try my best to pop my head in here and there, but just maintain your expectations and understanding that the group is more for participants to interact with each other. 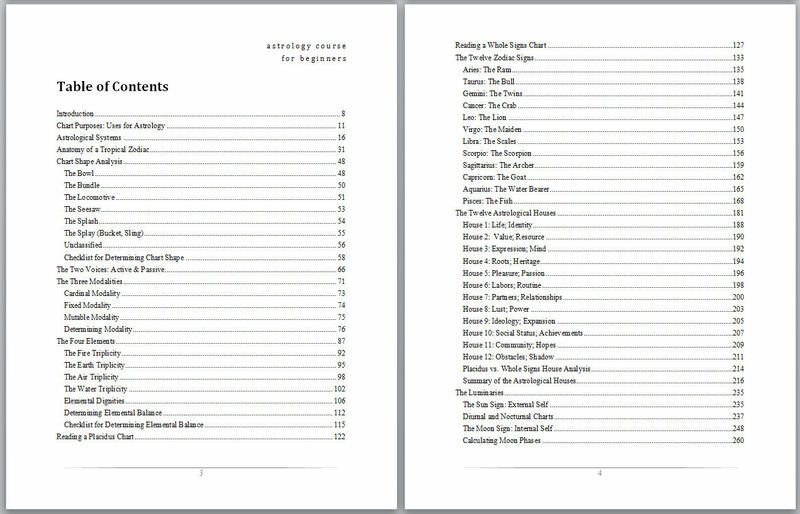 …so I’m providing you with a whole bunch of charts to practice on. 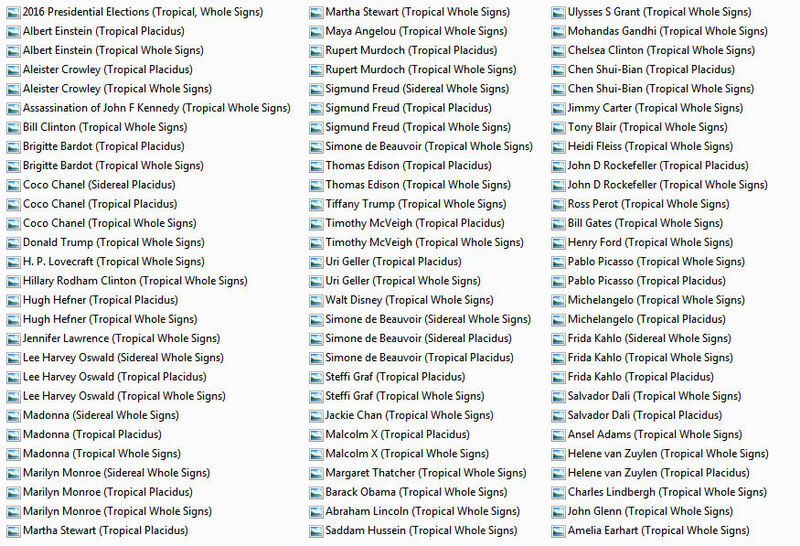 The course materials includes a zip file folder of birth charts for public figures, historical figures, and charts for a couple of major events that you can study. Many of them are referenced in the workbook as case studies to illustrate points I’m trying to make. 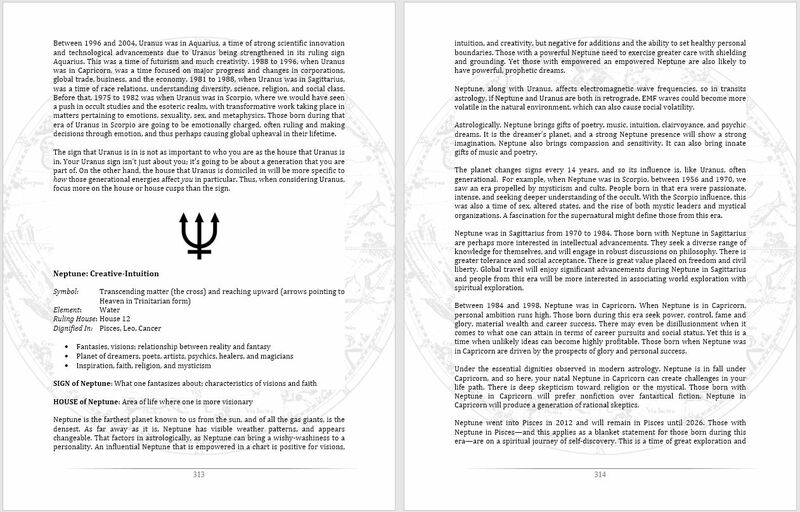 Advanced astrology topics, such as reading discrepancies between true node and mean node; in-depth understanding of the co-ascendant and polar ascendant; planetary returns and how to read them; esoteric astrology; midpoints; term rulers; past life astrology; aphesis; etc. Please be advised that IT tech support is not included with the price of your course materials. If you can’t figure out how to print the PDF double-sided, or formatted to fit a non-standard paper size you want to use, or you’re having trouble uploading through Lulu.com or any other third-party print-on-demand book printing service to produce your printed copy of the textbooks, I am not the one to contact with questions. If your concern is with print-on-demand service, then please contact that service’s IT tech support team directly. 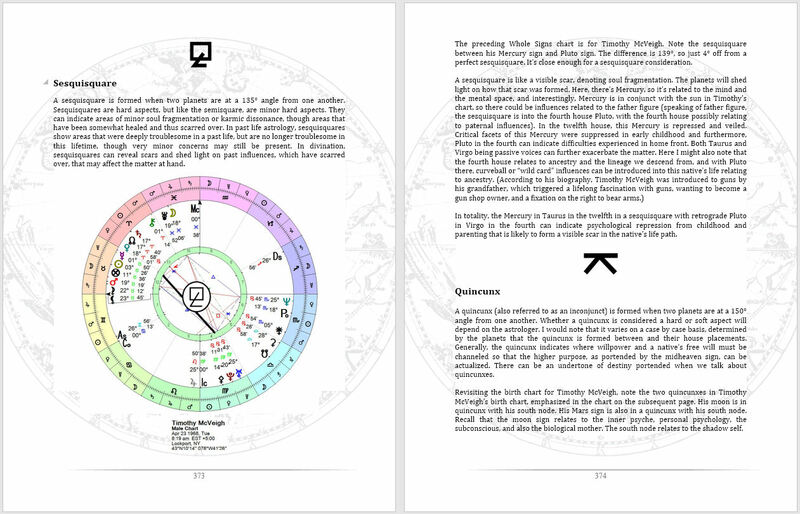 Dozens of sample astrological charts are provided in the course for you to practice the workbook exercises on. However, nothing beats practicing on your own, so I’m offering a $10 add-on service you can get in addition to the course, which will provide you with your birth chart (based on the birth details you send me) in four different versions, as noted below. Keep in mind you don’t need to get the add-on! You can probably find an online chart generator and get your birth chart for free, though getting all four versions may be hard, and even harder to get all four versions that feature many of the key sensitive points, asteroids, and dwarf planets we talk about, such as Eris, Chiron, Vesta, Hygeia, Pallas, Black Moon Lilith, and White Moon Selena, among others. To make everybody’s lives easier, provide your date of birth like so: March 1, 1971. If for some reason you really must send in numbers only, it must be: Month/Day/Year. Example: 3/01/71 for March 1, 1971. Do not send as 1/03/1971 or else I will write your birthday down as January 3, 1971. There will be no refunds. 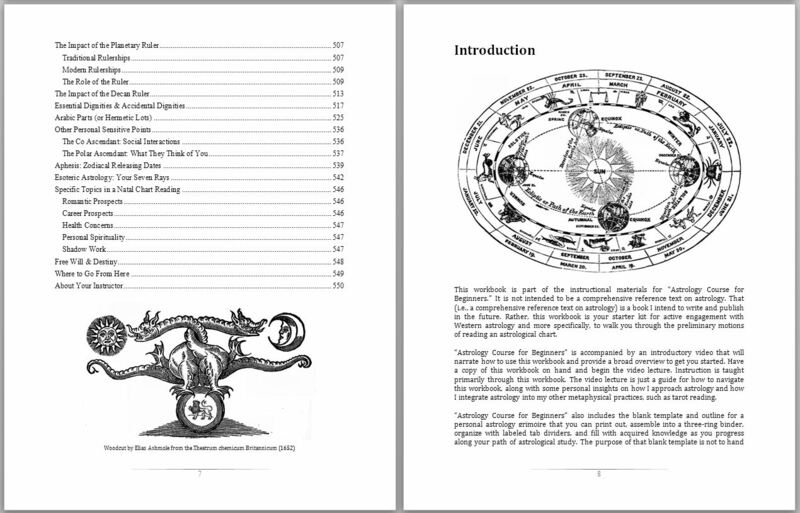 First of all, this course is already underpriced by maybe $100 if not more and if you don’t believe that, then either you have not been shopping around for online astrology courses or you really didn’t put in the effort to learn the content and use the materials provided, and now seek to punish me for your own lack of effort. Although there are no “hidden costs” involved, if you want to make the most out of this course and reap the biggest bang for your buck, I strongly recommend that you follow my suggestion and print everything out to bind or assemble into binders. If you send the files to a third-party professional printer, then it could cost about $20 USD plus whatever shipping fees are involved to spiral-coil-bound the Workbook. Considering the sheer number of pages of content, printing costs are likely to be significant, unless you have free access to a printer that is capable of taking heavy-duty print jobs. Send $55 (Fifty-Five Dollars) USD via PayPal to the e-mail address abelldelivers@gmail.com. Yes, it’s going to say “James Zhang from Castro Valley.” That’s the Hubby. Alternatively, pay by Amazon Gift Card, sent to abelldelivers@gmail.com. Direct link to Amazon gift card orders here. You will then receive a confirmation email response from me acknowledging the order and confirming delivery date. If you don’t receive a confirmation email within 2 business days of your payment, then please contact me at the below email address asap. If you’d like me to certify that you have completed the course, there are a few guidelines, which will be provided to you when you enroll, and then I’ll be happy to provide a Certificate of Completion for the hours you’ve dedicated to the course. A sample certificate below. I’m sorry I know how busy you are – I was wondering if you can still do a birth chart for me if I do not know my time of birth. I’m adopted so I don’t know. Either way, I’m definitely going to sign up and I’m so excited. I’ve been wanting to add another layer to my readings. I just started writing a blog and joining social media sites and wow, it takes a lot of time and effort. So I don’t know how you do all you do?! You generously offer such vast, in depth information on your site, in your book and now this course. You deserve all the success you’ve achieved and much more! Hi! I love your Tarot work and hope to soon start this course, too! I’ve struggled with learning astrology for a long time, but this looks so useful! Question, though – is it possible to receive or generate a Kindle copy of the book for this course? I know it’s a PDF but dunno if it would send to a Kindle. I like to read on the Kindle app so I can highlight without printing, stuff like that. Hopefully later on today, I’ll go ahead and purchase this course either way, though!